An essential aspect of immunoassay development is the identification of target antigens that are shed or secreted during infection that can be used as targets for diagnosis. In an attempt to identify circulating bacterial and fungal antigens that possess diagnostic potential, we developed a platform technology called “In vivo Microbial Antigen Discovery” or “InMAD”. This technique relies on the production of “InMAD serum” which is filtered serum that has been harvested from BALB/c mice infected with a microbe. The InMAD serum, which contains the microbial antigens that are potential diagnostic targets, is used to immunize BALB/c mice. “InMAD immune serum” is then harvested from the immunized mice and is used to probe microbial lysates. Reactive antigens are then identified by mass spectrometry. Antigens can also be directly identified by probing a microbial proteome array with InMAD immune serum. 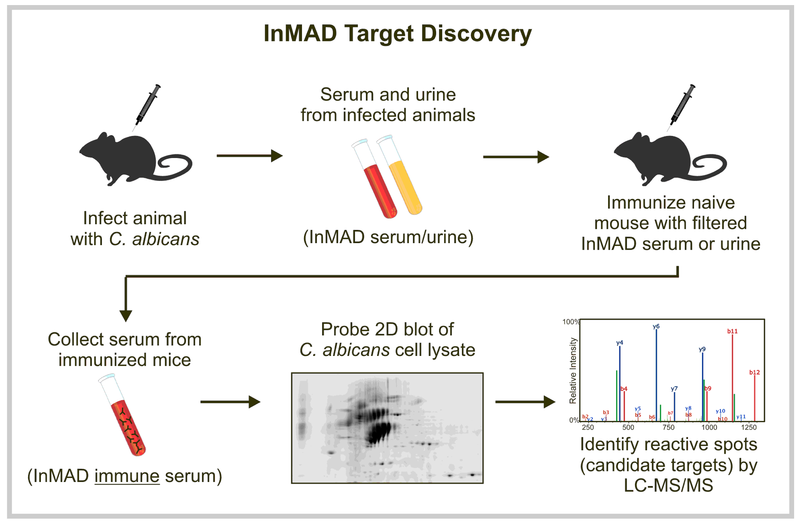 The microbial antigens that are reactive with the InMAD immune serum should be present in the serum from the infected mice, and are precisely the antigens that one would want to target if developing an antigen-capture immunoassay. By employing InMAD we identified multiple circulating antigens that are secreted or shed during infection with C. albicans, these antigens are considered candidate diagnostic targets.